Airstreamers are a strange tribe. 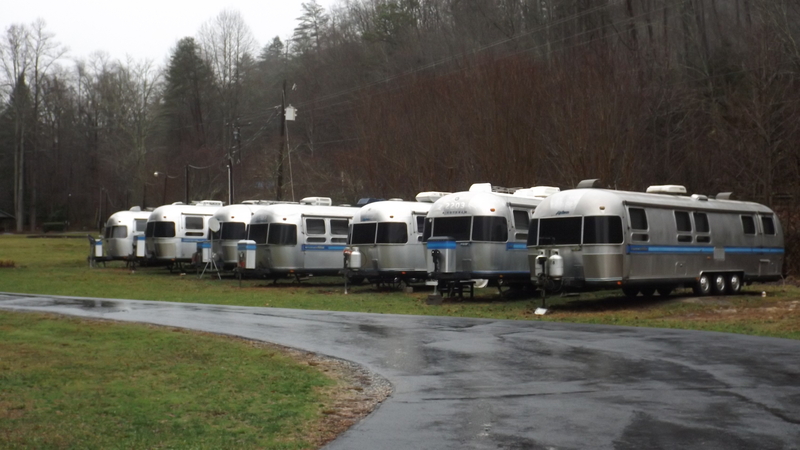 We have an online forum where all things Airstream are hashed out, and occasionally settled. Many of us take perverse pride in how badly we are gouged on repairs and maintenance by RV shops, dealers, and especially Jackson Center (the factory that builds them). We blink headlights to salute fellow ‘Streamers pulling their silver rigs. We share a common joke library (“What items are essential in every Airstream toolkit?” Best answer: “A roll of duct tape and a high limit credit card!”) We all use a certain dismissive acronym for those who pull other makes of trailer; spelled out it reads Some Other Brand. We even have a few Airstream-only RV camps, one of which offers full hookups for only $15 a night and is conveniently located on our route to south Louisiana. Thus we just had to stop for a few days at this campground known as Top of Georgia. TOGA is located near the Smoky Mountain alpine hamlet of Helen, GA. Helen is a delightful resort long on German cuisine, Austrian pastries, and boiled goober peas. Kat and I shared a first-rate Reuben sandwich and a slice of killer cheesecake, washing it down with authentic German draft beer served at a price worthy of Munich itself. 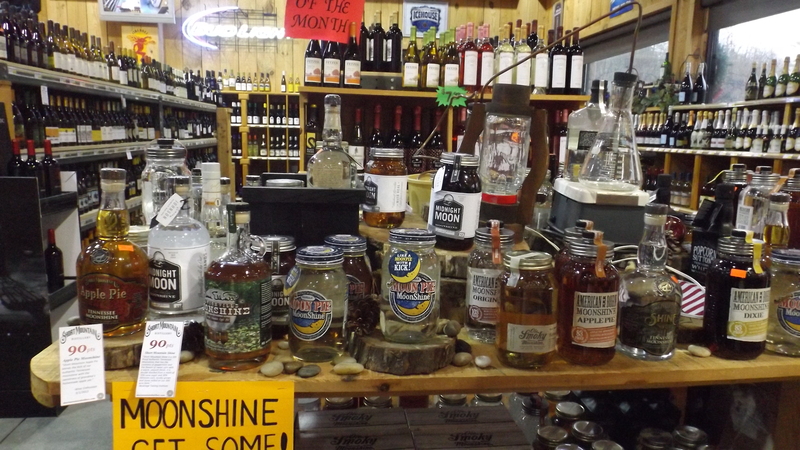 We sampled the boiled peanuts, but their vaguely English pea texture and insipid flavor translated into No Sale. TOGA is laid out along both sides of a clear mountain stream politely noisy enough to be audible when outside but not while inside with closed windows. 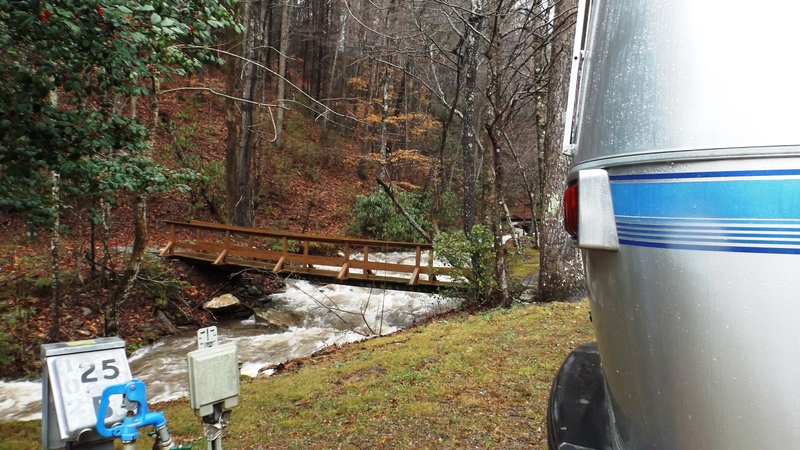 Our site, #25, was especially close to the stream, and we got settled in just before the rains came. It rained all day and it rained all night, and at some point in the darkness I noted to the Kat “Hey, I know I’m deaf and the windows are all closed, but isn’t that the creek I hear?” “Thanks, I really needed that.” She didn’t sleep so well, and the creek rose to within a few feet of flood stage when the rain stopped. Its watershed is steep and rocky, but small, and the rushing stream promptly receded. The weather faired off and the sun came out. 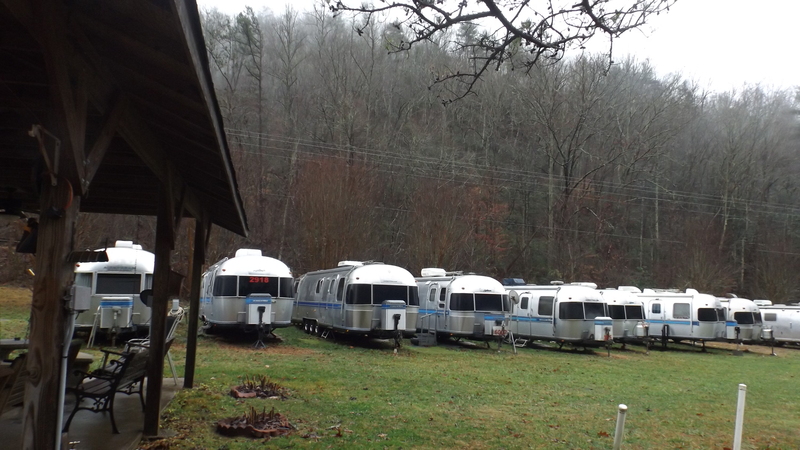 We explored the campground, gawking at the many old and a few newer Airstreams in storage. From another angle I noticed that most of the older ones had dings and dents on their aft ends, meaning somebody pulled them longer than he safely could. Then from around the front I saw way too many ghost numbers and not enough active red ones. It’s an Airstream tradition that once you sell your trailer or drop out of the Wally Byam Caravan Club, those red numbers must come off. Many stay in their unit and keep their numbers long after they stop pulling. Some of those ghost numbers were of the worst kind. 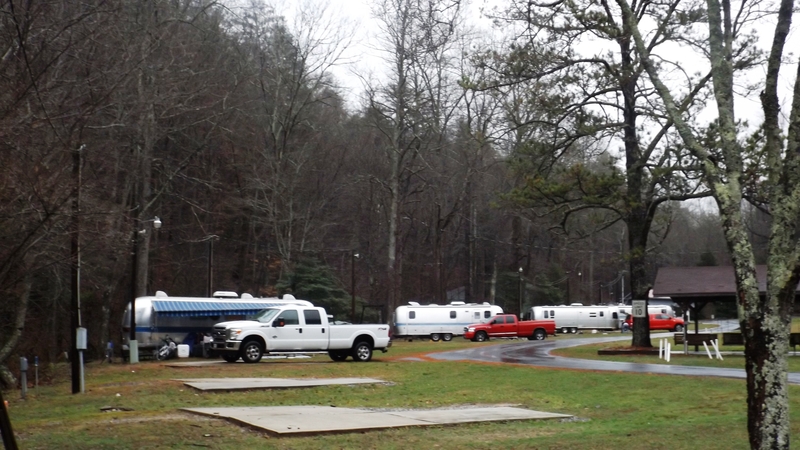 Those beautiful trailers now belong to old kids who don’t want to pull them, yet can’t bear to sell Mom and Dad’s rig. Cemeteries don’t bother me anymore. This does. We thought about one day camping here but not sure about the towing up mountains. How was it? It’s not bad at all. We came in around the Smokies and missed what mountains there are. Get to Helen, and going north there’s nothing to it. Going south, you have a tight left turn into the campground, but if you hog the road (i.e., nobody’s coming) you can do it easily enough. I think you’ll like ToGA. Not bad at all. There’s not a lot of traffic so you can borrow some of the other lane to make your turns into campgrounds, etc.